This monument is situated on the south side of Ballymacdermot mountain, County Armagh, the court tomb offers excellent views of the Meigh plain and surrounding countryside. As you can see from the picture above the court forms the best part of a circle with the largest stones furthest away from the chambers. The Tomb consists of a court and three chambers, the chambers are separated by jambs, these can be seen in the middle picture on the right. The chambers are now roofless but originally they had a corbelled roof, traces of which can be seen in the middle chamber. There is a large part of the cairn still surrounding the gallery. This is a beautifully situated tomb and well worth visiting. 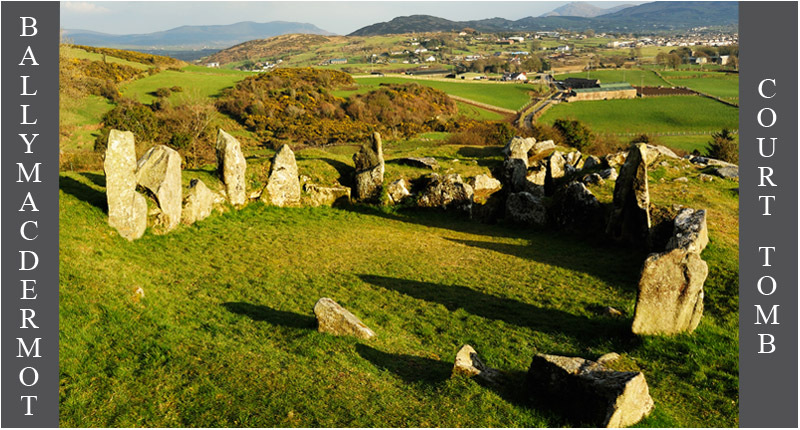 Other sites nearby include the portal tomb at Ballykeel and another court tomb at Clontygora. Situated: From Newry drive South from the first roundabout take the B113 west then take the first right after about a mile you come to a T-Junction take a right here, the tomb is situated on your right just after the turn and is sign-posted. Discovery Map 29: J 0649 2404. Last visit Mar 2014.